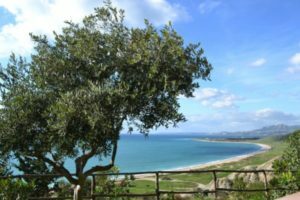 Thanks to its magnificent sea, Sciacca is experiencing a boom of tourism. The closest beach is Stazzone, with clear waters full of rocks. Then come Tonnara and Foggia, which are mainly sandy beaches. Capo San Marco Beach can be reached after a walk through palm trees and spurges. You then reach a series of small sandy beaches, where the sand is yellow and the sea deep and crystal clear, a true heaven for scuba divers thanks to the reefs rich in flora and fauna. The view from the beach is spectacular, with Capo Bianco to the east and Capo Granitola to the west. Going west, instead, you fill find Sovareto, Timpi Russi, and Macauda. Torre del Barone Beach is a long pebbly beach that lies at the feet of white cliffs, where you will also find a modern resort with English lawns. The beach is equipped with sunbeds and umbrellas. If you are looking for an accommodation check out our villas in Sciacca.